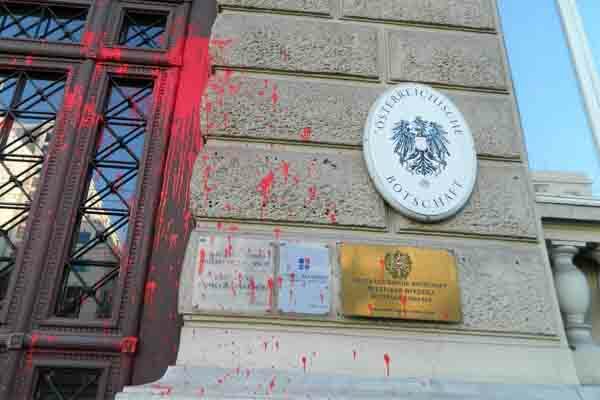 Statement and video about a political intervention in the austrian embassy in Athens by the anarchist collective Rouvikonas. Originally published by Indymedia Athens. Translated by Black Cat. The people of Austria “asked” for it and neoliberalism made it happen. Welcome to a new era of labour rights of the 21st century, which comes to abolish all the rights previously established through class struggles. But let’s take things from the beginning. Historically, Austria has always been one of the protagonists in European wars, whether we trace that back to earlier times in history when the country was called Austria-Hungary or in WW2 as one of the Axis powers. The inclusion of the country in the third reich was probably expected since there had been a long history of fascist parties in Austria. Let’s not forget that the very architect of nazism, Adolf Hitler, was originally from Austria. What we are trying to say is that nothing happens by accident. When people forget their history they are doomed to relive it. So, now the people of Austria voted for the conservative People’s Party whose leader is Sebastian Kurz and the Freedom Party of Austria. With the blessing of the two aforementioned political parties and the contribution, in votes, of the neoliberal opposition party (New Austria), the Austrian parliament approved the controversial law of the government regarding the legislation of the 12-hour working day or the 60 hour working week. This amendment seems to have passed without much reaction despite the importance of the labour rights it violates. This does not come as a surprise since the policies of the new administration were obvious from the start. From anti-immigration policies and a rhetoric of hate, to the erection of border fences and ‘stop and frisk’ practices by the army, the new international policy of Austria was very clear from the beginning. That is how we got to today and the legislation of a 12-hour working day which is set to start from September 1st instead of 2019 as it was announced initially. The Austrian government does not seem to be bothered by the international condemnation of its practices nor by the 100 000 protesters who marched in Vienna to express their opposition with the new law. Anti-immigration policies were followed by anti-labour policies which is what usually happens. Austria has been called to play a far-right role in Europe, in order to cover the political hypocrisy of Germany and other nations. Without any immigrants, those 12-hour days will have to be worked by locals whose unions remain in silence. This phenomenon is not confined in Austria but has been observed elsewhere in Europe: unions do not react and remain in complete apathy as a storm of policies against the rights of workers is now taking over the continent. What if tons of blood had been shed to establish the 8-hour working day and other fundamental labour rights? These seem to fall apart before a neoliberal agenda that aims to take us back to the tines where workers had to work from sunrise to sunset. We have come face to face with the constitutional slavery of the 21st century and workers remain indefensible against the greed of their boses. These provocations against the working class will not remain unanswered. For all of the above reasons we decided to intrude the Austrian embassy in Greece. We can’t stand indifferent when measures oppress the working class, even if they concern the citizens of another country. Proletarians don’t have a home country, but solidarity is their home. Next post: September 1: Enough is Enough! All out to #Chemnitz! Confront the fascist mob!